The scheme is open to all carers aged over 18 years who are caring for a person who is also over the age of 18 years who lives in Cornwall. What is the Emergency Carer's Card Scheme? 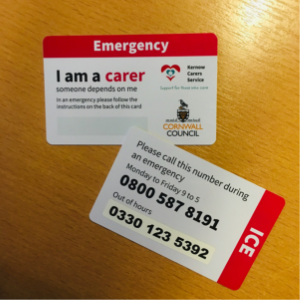 The Emergency Carer's Card Scheme is for carers who are concerned about what would happen if they were taken ill, in an accident or if another emergency stopped them from getting to the person they care for. The scheme gives peace of mind that, should something happen to prevent you from providing care, the person you care for will not be left without support. This enables the person you care for to receive the care they need whilst remaining in their own home until the emergency is over or until other arrangements can be made. Once complete, you will have the option to apply for an Emergency Carers Card. Complete the Emergency Carers Card application and we will send you the signature form. Once we receive your completed signature form in the post, we will review your application. You can also request a version of the form where you can type out the information by emailing us on eccs@cornwall.gov.uk.